Aaron McEneff celebrates reducing the deficit to 2-1 with his first half strike before the Danes ran riot in the second half. 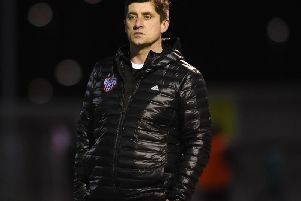 AARON McEneff insists Derry City will immediately turn attentions to plotting their Europa League return after crashing out of this season's competition at the hands of a rampant FC Midtjylland. The Danes proved a class apart as they followed up their 6-1 demolition in Denmark with an emphatic 4-1 win in the return leg at the Sligo Showgrounds but McEneff believes the experience has made City's young players hungry for more European football. And with City currently in fifth spot in the SSE Airtricity Premier Division table, McEneff knows they must bounce back quickly from the devastating European defeat with victory over Sligo Rovers at Maginn Park on Sunday. "It was a good experience for us but it's back to the league now on Sunday against Sligo," said the midfielder. "I think it's something all the boys want. As a player you always want to play against the top teams and that's where you're going to get it - in European football. It's a pity we couldn't get in to the next round this year but it's our aim, starting on Sunday to try get into a European spot for next year." The former Tottenham Hotspur man claims his first European goal comes as no consolation for the heavy defeat to the Danes, who he rates as the best side he's every faced. McEneff netted to reduce the deficit to 2-1 on 41 minutes but the 'ruthless' 2015 Danish champions emerged after the break with the bit between their teeth and ran City ragged. Derry City supporters congratulate Midtjylland players at the end of the Europa League First Qualifying Round Second Leg match between Derry City and Midtjylland at The Showgrounds in Sligo. "It's a nice thing to get a goal because we were actually playing really well and felt we had a chance of getting back into it. It's a big defeat and although it's nice to get a goal on a personal level, it's all about the team. It would've been nice if we got a win. "We knew it was going to be a tough game based on last week. They're a top, top side both on the ball and off the ball. They've got good players in every position and we knew what to expect tonight. "We have such a young side and it's something we can learn from and go on to improve ourselves. We have ambition to do the best we can. It's never nice to suffer a defeat like that and we have to react to it. Some will take it better than others but it'S something we all have to take in our stride and try kick on from. "We know there's teams obviously better than them as well but it's one of the best teams I've ever played against in terms of movement, ball retention and ruthlessness. They had a lot of quality." Derry City boss, Kenny Shiels believes the heavy Europa League first round defeat to FC Midtjylland will prove an invaluable learning curve for his young charges. "The boys performed really well and we were just beaten by a better opponent. There's no other way of dressing it up. They (FC Midtjylland) said to me they were impressed with our young lads. "When your players give everything what more can you ask? We could've scored more and they could've scored more. It could've been 10-5 on chances but they deserved to beat us. "It was a really difficult draw we got. It was a good experience and the learning that goes on for our young players is immense. They're up against top level players and can only learn from that."